A translation of the Bible into an Algonquin dialect was the life's work of a Presbyterian pastor John Eliot, and a monumental labor of love. Although the Bible could be read by only a handful of literate tribespeople, and the Native American language is no longer spoken, the book was a testament to faith in the New World--and the first Bible to be printed in the Americas." This land was dedicated to the propagation of the Word of God, by the Pilgrims of Plymouth Colony. This mandate was enscribed in the Mayflower Compact the colonists signed before they even left the ship and disembarked into the New World awaiting them. Translating the Bible's English into an Indian tongue, the Massachusetts Bible was, then, prime early evidence of the Pilgrims' and Puritans' dedication of their new American society upon a Christian foundation, something never before seen on this continent. Even the Catholic Spanish landing in Florida and colonizing there, principally at St. Augustine, Florida, did not found a new society, which grew into a new Christian nation.--Ed. "This traditional Hebrew manuscript belonged to a remote synagogue in Kaifeng, China. It may have been in use by the Jewish community thee for more than 300 years. The goatskin document, which is 71 feet long, was damaged in the flood that destroyed the city in 1642 and extends only to Leviticus 18:19." 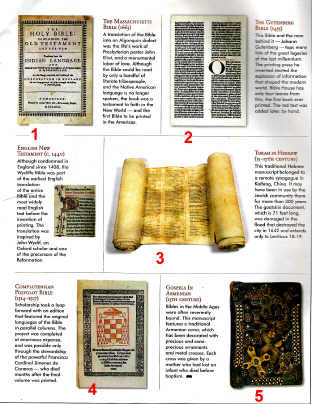 Scholarship took a leap forward with an edition that featured the original languages of the Bible in parallel columns. The project was completed of enormous expense, and was possible only through the stewardship of the powerful Francisco Cardinal Jimenez de Cisneros--who died months after the final volume was printed." "Bibles in the Middle Ages were often reverently bound. This manuscript features a traditional Armenian cover, which has been decorated with precious and semi-precious ornaments and metal crosses. Each cross was given by a mother who had lost an infant who died before baptism." Aramaic Targums--As the Hebrew language became more remote tot he common people, Aramaic was used to explain or paraphrase what the Scriptures meant. This was then put into written form. Septuagint (LXX)--The story is told in The Letter to Aristea" that in Egypt seventy (or seventy-two) translated the Hebrew Scriptures into Greek. This version, abbreviated "LXX", was often used by the NT authors. This version is the bridge between Hebrew tought and the NT. There were other OT translations in Greek: Aquila's Symmachus' and Theodotion's. Old Latin--These are versions of the OT and NT prior to Jerome's Vulgate. The OT was based on the LXX, not the Hebrew Old Testament. Vulgate--In A.D. 383 Eusebius Hieronymus, known today as Jerome, was asked to make a revision of the Old Latin versions, both OT and NT. Old Syriac--A dialect of Aramaic from the second century. Coptic--A later form opf Eguyptian from the hieroglyphic, developed in the Christian Era, written in the Greek alphabet. Sahidic and Bohairic are later dialects. Gothic--Ulfias in about A.D. 375 translated the Scriptures into Gothin (a Germanic tribe). Miscellaneous--Armenian, Georgian, Ethiopic, Slavonic, Arabic, Persian, Frankish, a nd manhy other translations were made throughout church history. Wyclyf's--The first English Bible, completed in 1382. John Pryvey was credited with a complete version in 1388. For 150 years this book was widely used and was the only bible that was complete. It was an extremely literal rendering of the Latin Vulgate. Tyndale's--In 1525 his NT was based on the Greek Text and hence, according to his oppo0nents, in "error" with the Vulgate rendering. He was a competent scholar. A great deral of KJV NT follows the Tyndale version. He completed only a portion of the OT. He was found guilty of heresy [which was nothing but persecution by an unrighteous clergy] and put to death by strangling [thus, Tyndale was a martyr for the cause of Christ and the truth of the Gospel). Covendale's--In 1535 translated by Myles Covendale, actually a revision of Tyndale's work. Matthew's--In 1537 a revision of Tyndale's version by one pen named Thomas Matthew (actually John Rogers). Tavener's Bible--A revision of Matthew's Bible by Richard Tavener. The Great Bible--In 1539 a revision was made of the Matthew's Bible by Covendale, supported by Cromwell. It was called the Great Bible because of its size. It became a popular version with the laity [meaning the common people, not the clergy]. Geneva Bible. In 1560 this was a revision of the Great Bible with Tyndale's clear influence, but closer attention in the OT to the Hebrew Text. This was the version used by the Pilgrims, John Bunyan, and King James himself. Bishop's Bible--In 1568 this was the revision of the Great Bible by Bishops, not early as popular as the Gemneva Bible. Douai-Rheims--In 1609 a Roman Catholic version. King James Version--In 1611 King James sanctioned a new version to be made. Forty-seven scholars were commissioned to do the work. This version was to have no marginal notes (the Reformer's notes were sometimes too radical for the status quo) and was to be used in all the churches of England only in time of divine service. The Bishop's Bible was to be the basis of the work. Though not accepted for the first 50 years, this version has endured over the centuries to the present day. See Authorized Version. The English Revised Version--the ERV, 1881. A committee work by 51 to 65 British and American scholars, who made as few changes as possible to the KJV while yet being true to the original. All changes were to be made by two-thirds majority vote. The American Standard Version--the ASV, 1901. This was the American edition of the 1881 version. The Revised Standard Version--the RSV, 1946. This is a revision of the KJV, 1881, and 1901 versions. The New Revised Standard Version (NRSV), 1990, is a revision of the RSV. The New English Bible--NEB, 1961. A completely new translation made by a joint church commission from England, Scotland, and Ireland. A revision is to be published in the 1990s. The Jerusalem Bible--the JB, 1966; New Jerusalem Bible, 1985. An English adaptation of the French La Bible de Jerusalem. A unique feature of this version is the rendering of the divine name of God as Yahweh, instead of the usual, the LORD. The New International Version--NIV, 1978. This version is a completely new translation, a trans-denominational effort by 115 translators in conjunction with the New York International Bible Society. The New King James Version-- NKJV, 1982. This is a partial revision of the KJV, done by 119 "translators," who removed some archaic word forms while maintaining essentially the same original text of the KJV. TANAKH--a single volume published in 1985. This is a work of the threefold Jewish canon of Scripture, known to Christians as the OT. Fourteen translators and editors were involved over the last three decades in producing the work. a. The Dead Sea Scrolls are manuscripts that were found in caves W of the Dead Sea in 1947 and in subsequent years. The community that produced the scrolls lived in Qumran. The place is known today as Khirbet (ruins of) Qumran, two miles N. of an oasis called Ain Feshka or En Feshka. The Dead Sea Scrolls consist of manuscripts containing portions of all the OT books except Esther. The largest portions come from the Pentateuch (especially Deuteronomy--25 manuscripts), the major Prophets (especially Isaiah--18 manuscripts), and Psalms (27 manuscripts). The Dead Sea Scrolls also consist of portions of the Septuagint, Targums, and Apocryphal fragments; a commentary on Habbakuk; and secular documents about the Qumran society. The Qumranic documents date between the third century B.C. and the first century A.D. The secular documents are of extreme importance because they shed much light on a period of Israel's history for which not too much written material exists. Prior to the discovery of the Dead Sea Scrolls, scholars possessed extant portions of the OT test in the Nash Papyrus (discovered in 1902, containing the Ten Commandments, dated around the second century B.C. ), the Cairo Genizah Fragments (dated between the sixth and ninth centuries), and various Masoretic manuscripts (dated from the ninth century and later). Thus, the Dead Sea Scrolls are a very valuable tool for OT textual criticism. b. Masoretic Manuscripts are those manuscripts produced by European Jewish scribes who, between the 6th and tenth centuries A.D. worked carefully to preserve the OT text as they transmitted it from copy to copy. (The Hebrew word "masora" means "that which is transmitted"; hence, the name--Masoretic Manuscripts). Some of the more important Masoretic Manuscripts are the Cairo Codex of the Prophets (A.D. 895), containing the Prophets; the British Museum Codex Orient 4445 (ninth/tenth century), containing a large portion of the Pentateuch; the Leningrad Codex of the Prophets (A.D. 1008/9), having the complete OT text; and the Aleppo Codex (A.D. 900-925), originally containing the entire OT text but now with a quarter of the text missing--lost sometime during the days Israel was being founded as a state. PLEASE RETURN FOR THE REMAINDER AS IT COMES ON-LINE SOON.